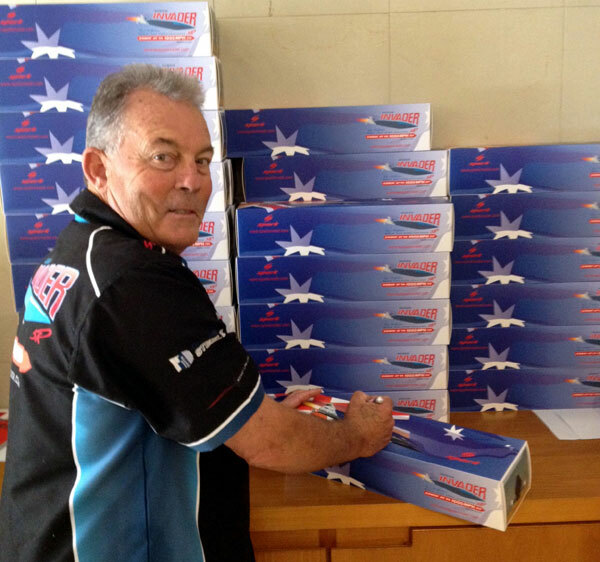 Land Speed Record Racing... You have just recieved the latest monthly update from Rosco McGlashan and the Aussie Invader 5R team. 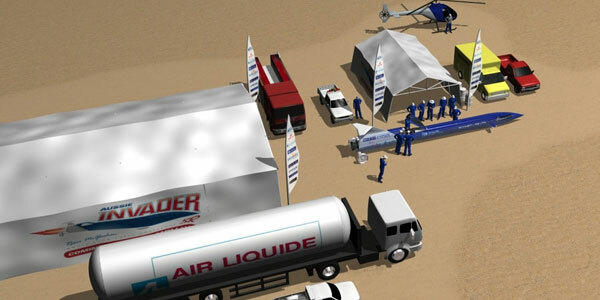 G,day to all our Aussie Invader Land Speed Challenge sponsors, supporters and followers, welcome to our February 2012 newsletter. Boy has it been hot here in Perth, Western Australia. We have had about 8 days of temperatures in the 40c + range and some of the crew do not like it too hot, so to keep productivity moving forward I lashed out and purchased two 36" high speed fans and mounted them on our workshop walls, nothing like a bit of high pressure hot air to keep everyone motivated. I love the heat but its just a bit too hot for comfort. 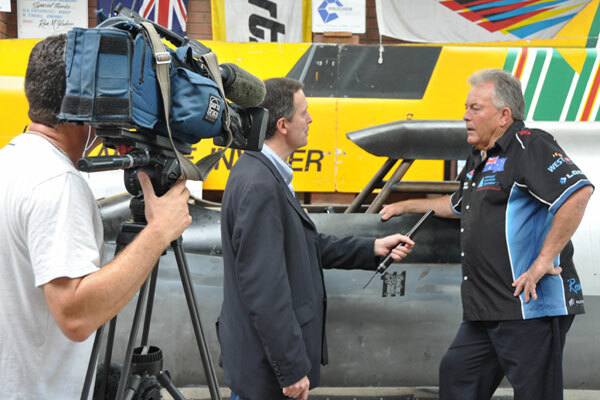 We have had a really busy past month with lots of media interest and news stories on radio, TV and newspaper articles about our project and the sale of Australia's Fastest Car, Aussie Invader 3, further development on our car, and some great people visiting our shop in downtown Mullaloo. Mike Annear has produced another one of his great video animations to help all our supporters and sponsors understand more about Aussie invader and how the finished car will look. We have decided to offer up for sale Australia's Fastest Car, Aussie Invader 3 to raise some much needed funding to complete our latest creation Aussie Invader 5R. As a lot of our followers will already know we designed and built Aussie Invader 3 in my home garage, with extremely limited funding, a crew of professional volunteers and many years of blood, sweat and tears. We peaked this car at 643mph (1,035 km/h) and set the Aussie Land Speed Record at 500 mph (802 km/h), I believe this is the only car to ever set a Land Speed Record on solid wheels on salt, if I am wrong I welcome being corrected. We also set a record for the fastest telemetary signal being recieved from a land based vehicle at the time (1996) according to our good friends at Tait Electronics. We have asked our good mates at Collectable Classic Cars in South Australia to handle any inquiries for her sale and so far our sale story has appeared in three of Australia's leading newspapers. I have also given several radio interviews and TV interviews are being conducted this week. We would love to keep this Aussie icon within Australia and are hopeful of finding a interested museum or collector to own this showpiece of Aussie motor racing history. The price tag is $300,000 Australian, so if interested in knowing more, give Collectable Classis Cars a call. As an update to last month's newletter, all our ordered models have now been dispatched and should either have been received or on there way. We still have a few of these signed high quality resin collectors models at $190 Australian, and orders/enquiries can be made directly by emailing Colleen at colleen@aussieinvader.com. This week we completed a great story for the BBC which should go to air worldwide within a week or two. The BBC's Duncan Kennedy flew to Perth from Sydney to cover this story and spent a whole day with the crew, Matthew Jewkes of Clarity Communications and our CFD team from Curtin University. Hopefully this will be a first class story and help us generate more international interest in our mission and what we are about to acheive for god and country. What Does 62,000 lbs of Thrust Look Like? Quite often my team and I get asked about the power of Aussie Invader 5R. With its 62,000 lbs of thrust it will almost certainly be the most powerful car ever to attempt the World Land Speed record. Although there is not a direct comparison between rocket thrust and horsepower, one can work out the horsepower needed for a vehicle to emulate the performance of a rocket powered vehicle and for Aussie Invader 5R that is 200,000 hp. Below is a picture of a hot fire testing of the Pratt & Whitney, 54,000 lb thrust motor, running on Nitrogen Tetroxide and Monomethyl Hydrazine for a Boeing program. The testing was conducted in early February, 2011. Our engine will be running on Liquid Oxygen and Bio-Kerosene, but it gives you a good idea of the explosive power of these engines. We have had some great visitors and long time friends pay us a visit over the past weeks. Our legendary sponsor John Di Candilo from Di Candilo Steel City who has helped me acheive success with several projects over many years made the trip out to our shop to check out the progress of our car and to learn where all the thousands of dollars of his steel product were utilised in her construction. It was a great day and without people like him on side our car would still be a pipedream, thank you John and the great team at Di Candilo Steel City. 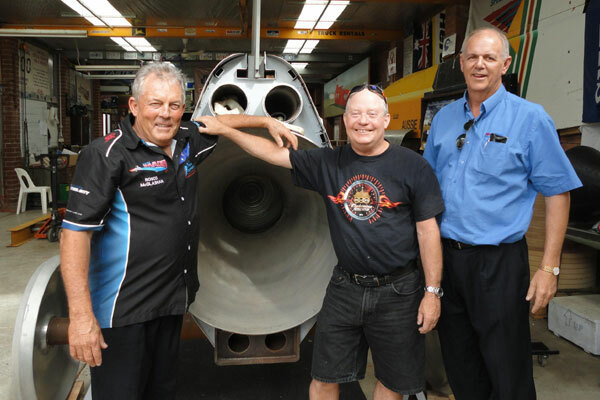 Also visiting us this past week were long time friends Gary Miocevich Director of the Perth Motorplex in Perth and Legendary US Jet Dragster driver Chuck Haynes. I have not caught up with either of these two guys in a very long time and we had a great time bench racing and talking about drag racing and I enjoyed showing them our car and some of the hardware which will make her a worldbeater. 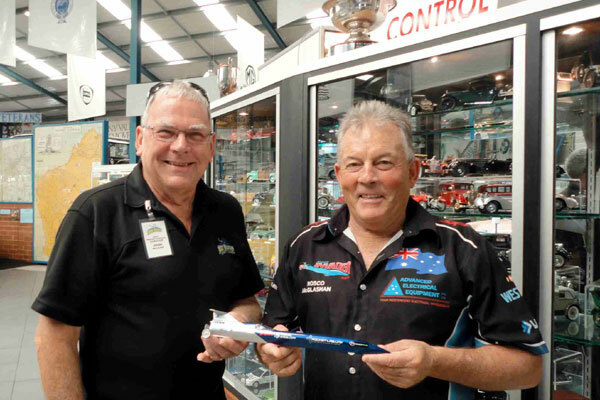 I was honored to visit our friends at Whiteman Park Motor Museum and present them with a model of our car. Our team manager Pete Taylor is a loyal supporter and volunteer for this museum and he arranged for him and I to visit and present our model to the museum curator John McLean for part of their great display of unique motor vehicles and accessories, a very interesting day. 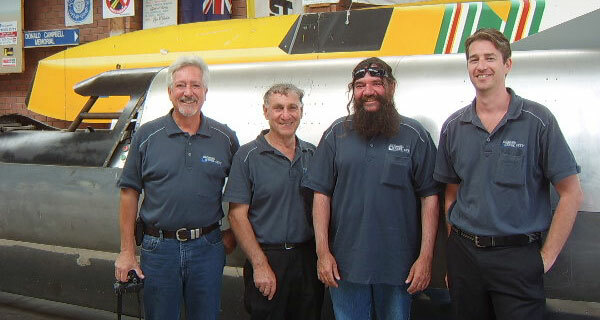 Brett Boughton is a member of our team and one of the best engineering teachers WA and Australia has to offer. Brett inspires his students with his enthusiasm for all things Aussie Invader. Brett has been the recipient in 2010 of the Engineers Australia “President’s Prize”, presented at Parliament House in Canberra. 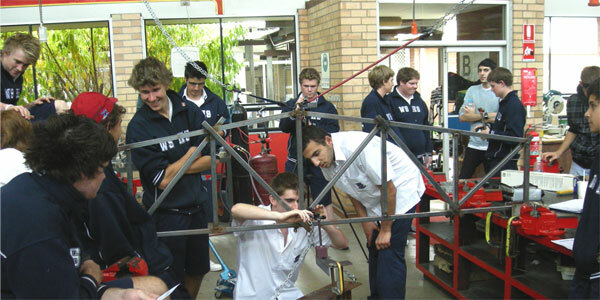 Brett has been working overtime to build a teaching platform for his year 12 students at Willetton Senior High School here in Perth. The research and effort he has put in is a mighty effort and the rest of our team are inspired by this man's enthusiam to motivate his students to excel in the STEM subjects (Science, Technology, Engineering and Maths) and get them excited about designing and researching various aspects of our project using Aussie Invader 5R as a learning catalyst. Brett is the man we need for our newly formed RACE (Regional Australia Community Education) program, it is a crying shame for us that he is so extremely busy with his students, but a blessing for them. We have lots of exciting developments with our wheel manufacture, rocket motor silica/phenolic ablative nozzle construction, composite nose and a hundred other jobs, but we need to be a little further down the road before I can elaborate on these issues. Hopefully by next month we will have some solid news. We also have several proposed expo displays being considered over the next two months, these will require a huge effort by the team to help prepare for these but hopefully the financial rewards will make it all worthwhile. If you wish to be kept up to date with the projects developments during the month and cannot wait for the next newsletter. Please make sure you regularly visit aussieinvader.com and our Facebook and Twitter pages. Let me take this opportunity to thank everyone who has given our project support and remind you that our team is out there knocking on doors, promoting our cause and doing our best to generate some good old Aussie Pride to anyone who will listen and our motivation and enthusiasm towards acheiving this goal for Australia is boundless. If you know of like-minded people who want to help support the Aussie Invader project, please let me know by emailing rosco@aussieinvader.com.